Le Portail Rouge is situated two minutes walk from the famous Beauvallon Beach, and a stones throw from the picturesque Venice inspired Port Grimaud. Ideally located at 6 kms from St. Tropez & 4 kms from St.Maxime, Le Portail Rouge gives the feeling of peace & serenity. Also to the rear of the villa is the renowned 18 hole Beauvallon Golf Course. The villa has been extensively renovated and furnished with tasteful, modern flair. Light, airy rooms add to the Mediterranean feel. Al fresco dining is provided on a large terrace, looking out towards the extensively planted garden and swimming pool. The grounds are completely enclosed, with a lawn that is ideal for children. The charming 'city on water' Port Grimaud is delightful both day and night with its waterside cafes and restaurants. St. Tropez with its charming port and abundance of restaurants and designer shops has captured a certain air of decadence and exclusivity in the South of France. The villa has rich terracotta floors and contemporary furnishings and decor. Satellite TV, DVD and CD Stereo. Fully fitted kitchen with a door to the garden. Living and dinning area with French Doors to the front garden. Double Bedroom 1 has French Doors overlooking the pool with en-suite bathroom. Double Bedroom 2 and 3 have en-suite bathrooms. Double Bedroom 4 does not have bathroom. Sleeping for the 9th and 10th person is provided in the living area on a sofa bed. Cot and high chair. 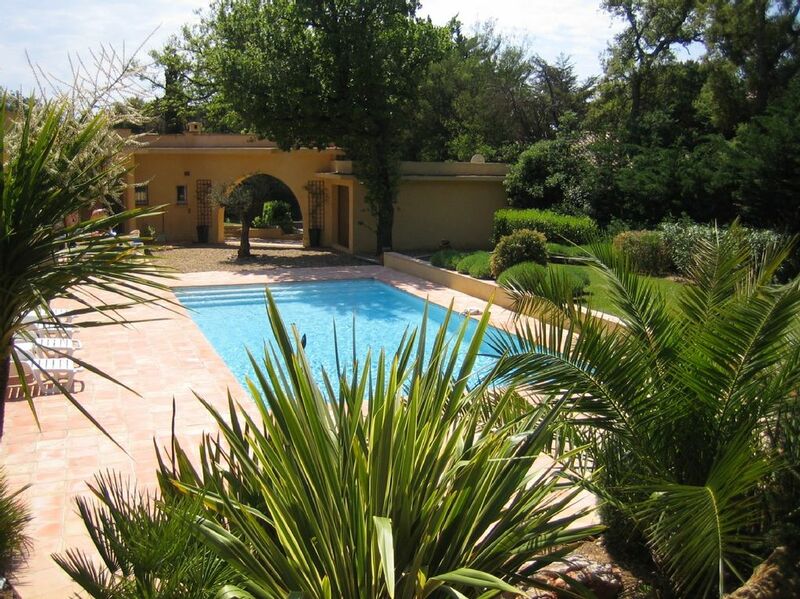 Enclosed Grounds, private pool, large garden ideal for children. Terrace ideal for alfresco dinning. Needs a bit of TLC. Well laid out and spacious but everything is basic from furniture to bed linen and towels. We were told to cover sun bed cushions so had to go out and buy towels even though the sun beds and covers were pretty grubby. We arrived at 8.30pm in the evening and there was no milk, water or any other provisions which was a bit disappointing. Great location in between Sainte-Maxime and St Tropez. The villa, garden and pool are just great. Fences on the street can close and everything is safely on the driveway. Alarm in the house is perfect and everything is there and can be used. We had a great holiday and hat is definitely a must. The booking and the other exchanges with the owner is great. We can also highly recommend this property. The house is very comfortable and well equipped with all you need and has plenty of space for 4 couples – a large living and dining room different outdoor eating areas, sunbeds, two lounges. One bedroom is in the cellar, but it was not a problem, as there is light and we only spent time there for sleeping. 3 bathrooms and two toilets are also enough for 8 people. The garden area and pool are beautiful it is a great private paradise! The location is great - an easy walk to sandy beaches and restaurants. A short drive to Port Grimaud, St Maxime or St Tropez. In addition, a bakery shop with the best baguettes is not far for breakfast at home. WIFI is working through the house and at the pool. We will come back one day, as we all enjoyed the very relaxing stay. Thanks for you lovely review, glad you all enjoyed your stay with us and we certainly look forward to you coming back again. I would highly recommend this property for a family vacation. The house is comfortable and well equipped and has plenty of space for the entire family to relax – a large living room and three different outdoor eating areas. I don’t think we ate a single meal inside our whole week there! The garden area and pool are beautiful, and we typically lounged there during the morning and went to the beach after lunch. It was our own private paradise! The location is great - an easy walk to two different sandy beaches. And an easy drive to Port Grimaud, St Maxime or St Tropez for a day trip. The only thing worth noting is that the fourth bedroom is in a cellar below the kitchen, but it worked perfect as a kids bedroom. My family and I thoroughly enjoyed our week-long stay at this charming vacation home. The rooms are comfortably apportioned, as are the common areas -- capacious living room with three couches, dining room table that easily sits eight, and fully-equipped kitchen. We did almost all our cooking at home and really put the kitchen through its paces, and it stood the test. Beach is within a hundred yards, and it's straight sand all the way to Port Giraud about a mile and a half away. Lots to do in the surrounding area, but the pool is such a jewel that you could be forgiven for not getting out much. Only minor quibble is that there's no on-site provision for recycling, which we resolved by walking our recyclables down to the depot at the nearest campsite. Bottom line, we look forward to going back, and would recommend Le Portail Rouge to anyone. Thank you for your kind comments, gald you enjoyed your stay. Fint hus, perfekt för barnfamiljer och härlig pool. Kraftigt trafikerad gata men inte störande. Bra och rymligt hus, perfekt för barnfamiljer. Härlig pool. Tre stora och bra sovrum , alla med eget badrum. Fjärde rummet i källaren var mörkt och lite fuktigt. Bra och stor trädgård för barn att leka i. Fina uteplatser. Starkt trafikerad gata utanför huset, som inte var störande då man var i huset, men då man skulle korsa gatan. En gångtunnel under vägen fanns ca 100 m från huset, då kom man direkt till en fin liten strand. Bra läge, lätt att ta sig till olika byar, andra stränder och sevärdheter i omgivningen. Framför allt härligt väder och fantastiska varma bad! Stunning Gorges De Verdon 50 km. Golf Club de Beauvallon (2km) - This is a 18 hole golf course, par. It is part of the 5 star Beuuvallon Hotel. The newly built club house excellent amenities, including bar and restaurant. The course is open to non members, the max handicap for men 32 and ladies 35. There is a resident professional and lessons can be booked through the club house telephone number04 94 96 16 98. Sainte Maxime Golf Course (4km)- this 18 hole golf course is set on a hillside offering fabulous sea views. It is par 71 )6155m)..
Also a golf course is being built at Gassin, this is 7kms from the villa.